I’ve made this dish a day before Diwali and since then I wanted to post it, but couldn’t find time to do it. Finally I am posting this recipe today. 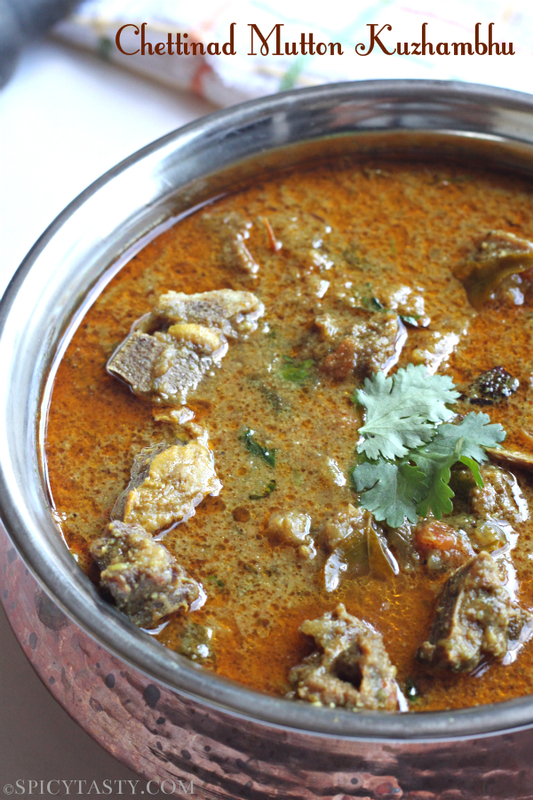 This mutton curry is one of the most easiest and flavorful dish I’ve ever made. 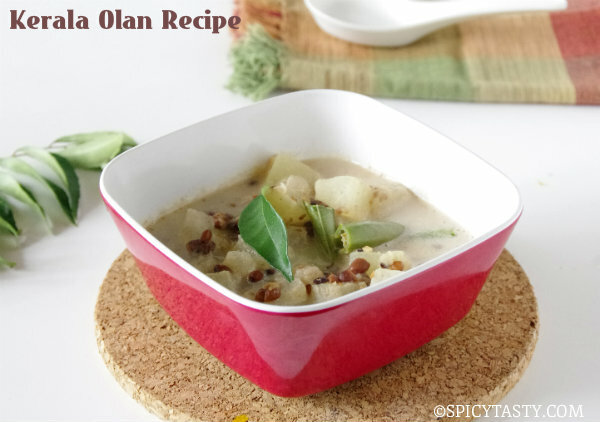 It’s an authentic chettinad recipe I’ve got from one of my friend. 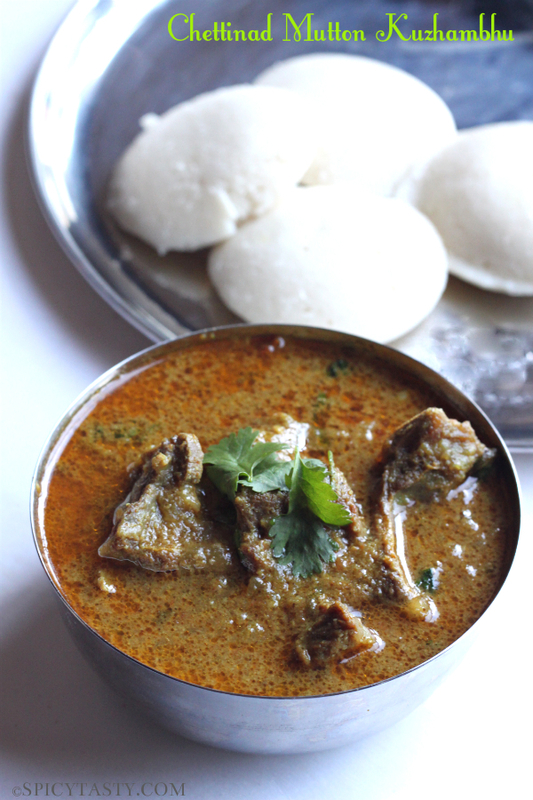 Chettinad dishes are most popular in southern part of India. You can find chettinad dishes on any restaurant in South India. 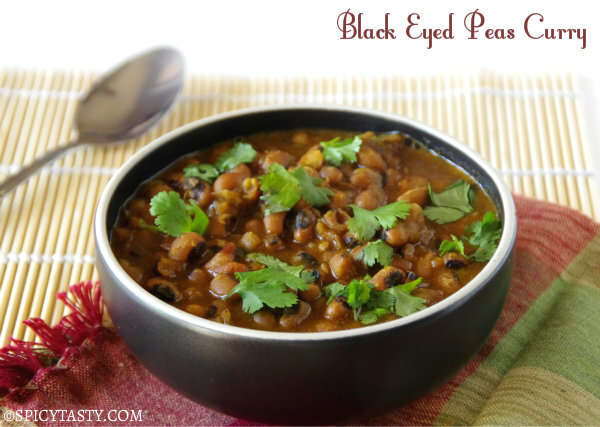 The ground masala is key to this dish and makes it more delicious and it gives nice aroma. Try this recipe and let me know how it turned out for you. Dry roast all the ingredients listed under “To Grind” and grind them into smooth powder. Also make a paste of cashews and keep it aside. Grind the coconut to a smooth paste. Keep aside. Now Wash and cut the mutton into small pieces. Heat oil in a pressure cooker and add fennel seeds, cinnamon, cloves and bay leaves. Now add the chopped onion and fry them until it becomes light brown and add curry leaves. Now add ginger garlic paste with salt and fry them till the raw smell goes off. After that add the tomatoes and sauté well. Now add the ground dry masala powder prepared in step 1. Mix it well and fry them until the raw smell of the masala goes. Mix well and add the mutton pieces along with turmeric powder and sauté for 6-7 minutes in medium heat. After that add a cup of water. Mix it well and close the pressure cooker with lid. 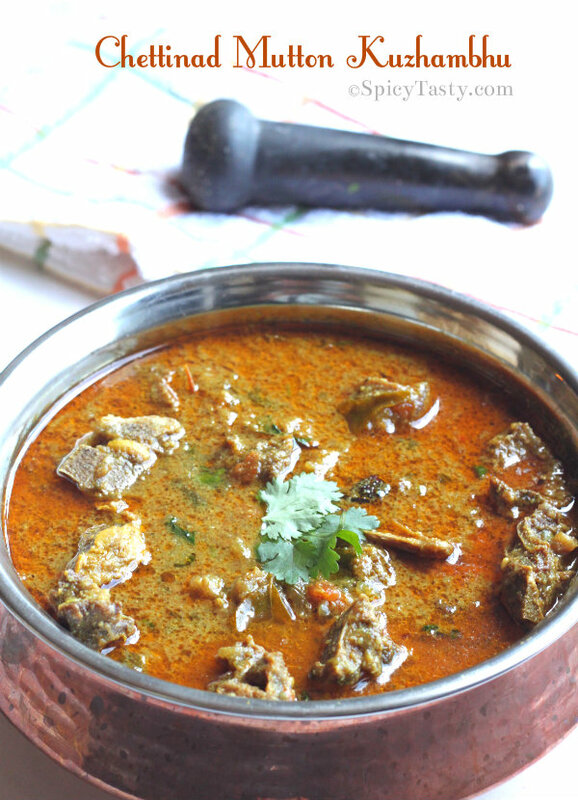 Pressure cook the gravy for about 5 whistles or until the mutton becomes tender and fully cooked. After that remove from heat and once the pressure gets released, open the cooker and add the coconut paste and cashew paste. Again let the gravy/Kuzhambhu sit in heat until it comes to a boil for about 5-10 minutes in medium heat. If you don’t have pressure cooker you can cook it in a wide kadai/pan and cook the mutton with closed lid and with the same instructions mentioned above. Fantastic recipies , just glad I found your site . All family use it on a regular basis . The cashews part is a lil confusing. It is in the list of ingredients to be ground after roasting. Does this mean I roast it and then make a paste of it?? ?